Posted on Sat, Jan 7, 2012 : 5:56 a.m.
Shelley Salant is involved in many different aspects of the local music scene. Shelley Salant lives and breathes the local music scene. From behind the counter at Encore Records to behind the mic at WCBN-FM’s "Local Music Show," to behind live shows happening anywhere from house parties to the Blind Pig to the Neutral Zone, Salant is a one-woman cheering section for local music and the people who play it. It’s hard to think of a facet of the local music scene that Salant isn’t involved in. She works at Encore Recordings and co-hosts WCBN-FM’s long-running "Local Music Show" (9 p.m. Wednesdays, 88.3-FM). She books show at such divergent venues as house parties, the Blind Pig and the Neutral Zone teen center. She plays in various bands, including drums in the delightful local “supergroup” Swimsuit. She even has her own label, Ginckgo Records,” which recently released a 7-inch by one of her favorite bands, Bad Indians. You might call Salant the den mother to the Ann Arbor music scene, even though she’s just 22 years old. From there, Salant’s involvement on the scene mushroomed, providing her with a secondary education of sorts on all aspects of the music business. Before long, she was working at Encore and “interning” at Fred Thomas’ Ypsilanti Records label. Even thought she didn’t really play keyboards, she started gigging regularly with Charlie Slick as his keyboard player. 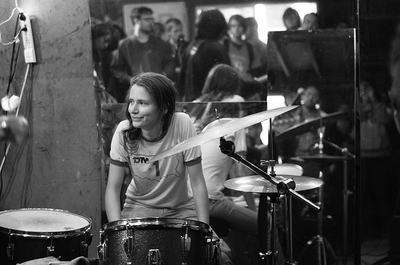 And even though she’d never really played bass or drums before (guitar is her primary instrument), she went out on tour with punk upstarts Tyvek, alternating as their bassist and drummer. Last year, she connected with Thomas (Saturday Looks Good to Me), Amber Fellows (Damned Dogs) and Dina Bankole (Secret Twins) to form Swimsuit—in which she’s also the drummer and carrries an equal share of songwriting duties. The band has toured around the country and released its eponymous LP, which was our favorite new record of 2011. She’s even been playing some solo shows lately, showcasing her psychedelic instrumental guitar tunes. Yet for all her musical activities, Salant may be best known for her behind-the-scenes work promoting shows and advancing the local scene over the WCBN airwaves. Each Wednesday, as it has for more than a decade, the "Local Music Show" showcases local bands and performers, usually featuring live, in-studio guests. For local bands, performing on the "Local Music Show" is a sign that they’ve unofficially “arrived” on the scene. “I kind of just knew I was the perfect person for it,” she said of being recruited to take over the show’s microphone last year. Meanwhile, she’s been promoting tons of shows, including a recent set by local psych-folk band Wiccans at the State Theater and smaller shows at Name Brand Tattoo, The Bar in Braun Court, and countless house parties. “I just kind of tried to figure it out as I went along,” she said. “And now, I guess I sort of know what I’m doing, but I still learn something new each time I put on a show." Salant said she never set out to assume a position of prominence on the local music landscape. If that’s what’s happened, it’s simply been the result of her hard work and Zelig-like omnipresence. Thomas, her bandmate and erstwhile mentor, said Salant is a key fixture on the local scene. “Shelley accomplishes so much by the surprisingly rare merit of just being herself,” he said. “It sounds kind of corny, but the truth is there's really nobody like her that I've ever met, and certainly not many people around town working so altruistically and giving so much of their own time and energy to make things more fun and exciting for everyone. In fact, Salant said she’d love to see more people doing exactly what she’s doing now to help pull the local scene out of what she views as a bit of a temporary slump. Mon, Jan 9, 2012 : 1:37 p.m.
Well said. Shel, you inspire so so many of us. Sun, Jan 8, 2012 : 11:50 p.m.
Well deserved props for an awesome person. Sun, Jan 8, 2012 : 5:04 a.m.
Holy smokes, Shelley is a gem. Shelley had a hand in so many of my favorite shows and the best nights of my life. She's perhaps the most modest human being I've ever met &amp; tireless in her support of the underground. And her taste is impeccable; in the last year, there was not a single show she put on a with a less-than-great band. I can speak for many others and without hyperbole when I say that knowing Shelley has made life a lot brighter. Also: her record collection is insane. Sat, Jan 7, 2012 : 7:01 p.m. I don't know Shelley personally, but from the little I do know about her, this is a fitting tribute. I remember meeting her behind the counter at Encore Records a couple of years ago. I mentioned something about a local music group that I didn't believe was promoting itself very well, which I thought was disappointing because they're great and I wanted to see more of them. She quickly reached down and pulled out a handmade flier that I believe she had drawn up herself and handed it to me to keep. There was a small stack of photocopies of the flier. It listed all of the upcoming shows in the area for the group I had mentioned as well as several other local acts. A while later, I had the pleasure of seeing Swimsuit play at the Blind Pig and, yes, they rocked. Keep it up, Shelley! Sat, Jan 7, 2012 : 5:46 p.m. Such a rad chick! Play a show in Hamtramck soon! Sat, Jan 7, 2012 : 4:02 p.m. So wonderful to read about the impressive accomplishments of this creative young woman! Sat, Jan 7, 2012 : 3:37 p.m. Sat, Jan 7, 2012 : 11:23 a.m.